My Nannie lives in Northern Queensland, so when I first told her last year that we were heading this was she said that she would come and see us. 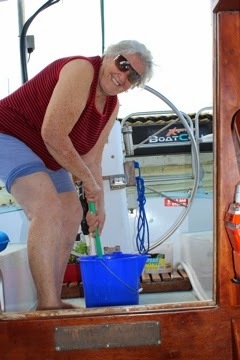 When I asked if she would like to stay on the boat, she said "well yes, I think I would." The first time we had this conversation I probably didn't even really know myself what living on the boat entailed but here she was 80 years old and ready to give it a go. So when we did <finally> make it up here, we gave her a call and a few days later she was on board Batty. 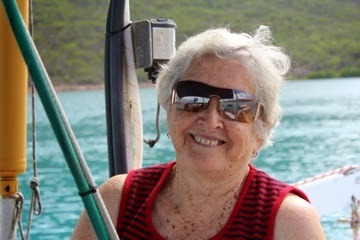 We met up with her in Bowen and spent the night on the public jetty just to ease her into it and from there Nannie got the good, the bad and the ugly. Our first day sailing was, of course, not as forecasted. 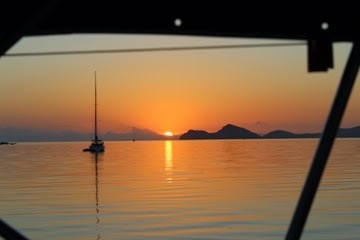 So after we left Bowen we ended up cris-crossing around the bay as we beat to windward. For non-sailors, a sailboat cannot sail directly into the wind. So in order to sail in that, you need to sail just off the wind in one direction, then tack and sail just off the wind in the other direction and repeat, ad nauseum. Sailing close to the wind like that causes the boat to heel over (tip) substantially so it is not a very fun way to travel and best to avoid if possible. Unfortunately, there wasn't really anywhere nearby that we thought we offer us protection so we stuck with it. Not far into this fun game, we went to put the jib (front sail) down and discovered that our furler was broken. Sorry for using so much sailing technology but bear with me... I hope it's interesting! :) The furler allows us to control the jib from the cockpit as it roll up inside itself on the forestay for storage (the wire at the front of the boat that runs up to the top of the mast and supports it) and comes unwound when we use it. The alternative is one or both of us needing to go up on the foredeck (the front of the boat) to put it up or down manually. It's an amazing system... when it works! 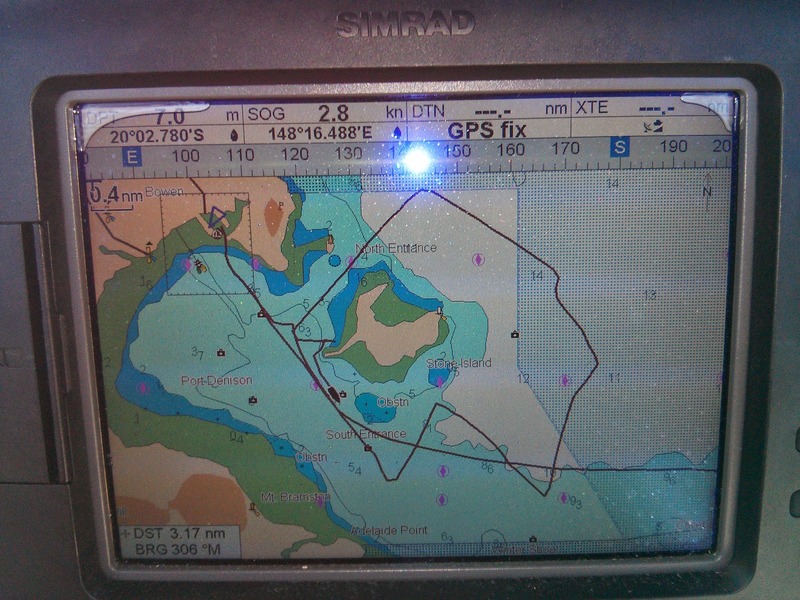 So... instead of continuing our trip across to Gloucester Island, we ended up doing a circle around Stone Island, just off Bowen. I think Nannie was blissfully unaware that as the sun was setting after sailing all day, we ended up just a couple of miles from where we started. She was just enjoying the ride... though she did comment that she could feel that it was a bit stressful at times. We were hoping for better winds the following day so we could cross the bay without needing the jib. It was unfortunately more beating to windward but it was made bearable by the staysail (a smaller sail up the front of the boat) and we made it. 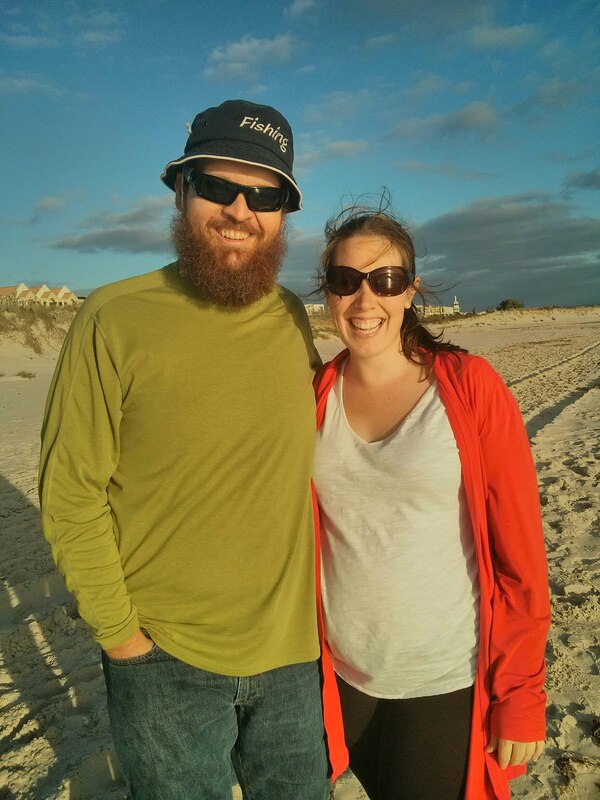 We arrived at Bona Bay with enough sunlight left to stretch our legs on the beach. The following morning Bryce was up on the foredeck trying to fix the furler when a nice man, Peter, popped over to say hello. Turns out he was a boat builder and wanted to help Bryce fix the furler! Cruisers are such nice folk! It wasn't as bad as Bryce initially thought and Peter saved him (us?) much angst by helping with the repair. From Bona Bay we headed around the corner to Breakfast Bay to wait for a window to head out to the islands. We had three days of little to no wind, the water perfectly still. One day we tried to make a run for it, thinking that there might be some wind out there hiding on the other side of the mountain but we turned back disappointed. As it was so flat, I was finally able to convince Nannie to come up on the foredeck to explain how the anchor worked as we pulled it up. Thankfully there was no wind at all because just as we had the anchor in sight, the chain jumped off the windlass (the machine that saves our poor arms by pulling up the anchor for us) and the chain started running out freely. Just a little excitement to keep us on our toes! All was OK! It always is! Doing Laundry... We put her to work! When we were finally able to leave we had a gorgeous morning sailing and then the wind changed. We reevaluated and changed directions to head up to Double Cone Island. When we got there, it appeared as that staying there would've made for a rather un-enjoyable night so we hightailed it across to anchor at Blue Pearl Bay on Hayman Island again. There are many resorts in the Whitsundays and Hayman Island Resort is one of them. There resorts that are situated on islands that are National Parks can not restrict use of their hiking trail by non-resort guests. 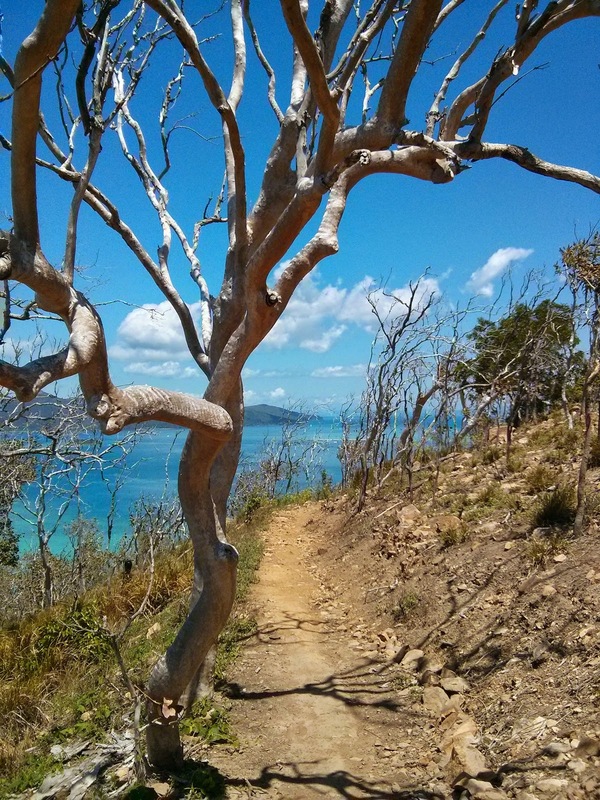 Hayman Island is not in fact a national park but we got a bit confused thinking it was and so had a lovely hike up to the resort and saw tons of wallabies (Sorry, resort management). Blue Pearl Bay is just magnificent. Stunningly crystal blue water that is so deep all you can see is the parrot fish swimming underneath the boat. Despite the fact that we had had mostly miserable sailing weather, we had been blessed with calm and comfortable anchorages while Nannie was with us. Blue Pearl was mildly rolly while we were there and then when we headed over to Airlie Beach, we had a bit more rolliness (this may not be a word but you catch my drift). 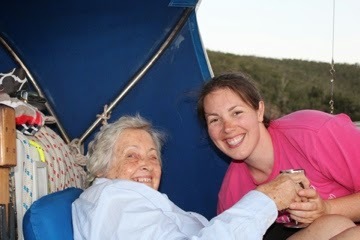 Nannie took it all in stride as she enjoyed being rocked to sleep by the boat. Over the course of the week she was with us, Nannie found that all of her aches and pains went away. She was able to crawl into her bunk and maneuver around in it without any problems and was able to really relax. We absolutely loved having her on board. I'm so proud and in awe of her to have so eagerly jumped on board (literally!) this adventure. Mum you look great! Alissa and Bryce you get gold stars! Thanks! We all had a lovely time! Hi Alissa, I just came across your blog on nannies FB page while posting her birthday greeting. Loved your blog & adventures.